I recently had the opportunity to speak with Mike West, ATC, former President, California Athletic Trainers’ Association (CATA) regarding pending federal and state legislation in support of athletic trainers and other sports medicine professionals in California. 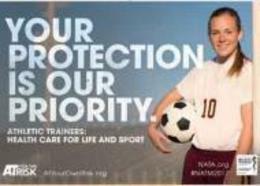 Athletic trainers have been proven an integral part of an overall sports safety plan and it’s important to reinforce this role with relevant legislation at all levels. The House of Representatives has moved to protect athletic trainers, sports medicine physicians and other sports medicine professionals who travel across state lines as part of their employment duties to provide care to athletes and athletic teams. Introduced to the House at the beginning of 2017 by Rep. Brett Guthrie (KY) and Cedric Richmond (LA), HR 302 attempts to provide protections to licensed/registered athletic trainers and other sports medicine professionals (including physicians) who practice in other states in their defined role on behalf of their employer. The bill was recently read by the Senate and was referred to the Committee on Health, Education, Labor, and Pensions. This legislation is particularly important for those athletic trainers and other sports medicine professionals who work with organizations and/or schools who travel regularly with athletes/teams across state lines to care for their athletes and athletic teams. This law ensures consistent care. Think of your favorite college football team traveling from one coast to the other to participate in a game – the sports medicine staff is practicing in a secondary state and should be protected to provide continuity of care. The bill is supported by: National Athletic Trainers’ Association (NATA), American Medical Society of Sports Medicine (AMSSM), American Academy of Family Physicians (AAFP), and the American Academy of Orthopedic Surgeons (AAOS) to name a few. If you would like to express your support to this legislation contact your members of Congress and encourage them to ensure the bill makes the floor for a full vote. AB 1510, was introduced by Assembly member Matt Dababneh on February 17th, 2017 and is a licensure bill requiring athletic trainers with appropriate education and certification to be licensed by the state in order to protect the patient's safety. I think it is important to find out if student athletes have an athletic trainer at their school (over 750 high schools in CA do not have an athletic trainer). If not, I would encourage parents to talk to their local school board to find out how they can add an athletic trainer. If there is an athletic trainer, find out if they are certified or not. Anyone can go to the BOCATC.ORG website and do an online certification verification search by a person's name and state to see if they are certified. If they are not certified, it is critical for athletic directors, principals, and school boards to be aware of this situation and the potential harm to student athletes and increased liability placed upon the school. I would encourage everyone to contact their state senator and assembly person to express their support of AB 1510. Lack of licensure has had a palpable impact on sports safety in California. According to Mr. Bennett, the CATA, along with other stakeholders, have identified numerous instances of harm to athletic trainers and patients by unqualified persons hired as "athletic trainers" in the state. For example, the CIF has identified 145 schools that report having an athletic trainer who is uncertified as such. From those 145 schools, there are over 80,000 high school student athletes who are provided health care services by an unqualified athletic trainer. This also translates to about 1,600 concussions each year that are initially evaluated by someone without appropriate education on head trauma. It is time our children have healthcare services provided by qualified professionals. According to Mike West, “All other states have licensure, we should do it in protection of the public and our kids.” Not only is licensure important, but ensuring athletic trainers are available at our schools and have the ability to educate and protect student-athletes is critical. According to the Eric Paredes Save a Life Foundation, Eric’s Law was signed by Governor Brown on September 22, 2016. The law expands student-athlete safety standards to include sudden cardiac arrest (SCA), requiring student athletes to acknowledge annually that they received an SCA fact sheet that includes a list of warning signs. Coaches are also required to remove any athlete who passes out or faints during athletic activity, starting July 1, 2017. Learn more about SCA at EP Save a Life Foundation. Check out the CIF resources and protocol available in support of this legislation, HERE. Remember, one youth athlete dies every three days in the United States as a result of SCA and SCA is 60% more likely to occur during exercise or sports activity, putting athletes at greater risk. As my conversation with Mike progressed he mentioned something that is in the early stages of discussion – the Southern Section of CIF Executive Committee is considering making a recommendation that all high schools must have a full-time athletic trainer. Admittedly, this cannot be mandated at this time, but the group is taking a serious look at how to ensure that young student athletes have access to a full-time athletic trainer at their school. If you’d like to learn more about this possible CIF recommendation or would like to voice your support please feel free to contact the southern section officers. What will you do to make your student athletes’ protection your priority? Acknowledgement: A special thank you to everyone I spoke with in the development of this blog - Mike West, Jason Bennett and Carter Paysinger. Your insight and direction has been invaluable.